(Central Islip, N.Y., Nov. 20, 2018) – The Long Island Ducks and Good Samaritan Hospital Medical Center today announced a partnership making the hospital the presenting sponsor of the Ducks 20th Anniversary Season in 2019. As part of the presenting partnership, Good Samaritan Hospital’s logo will be included as part of the team’s official 20th Anniversary Season logos. Additionally, the logo will be featured in print, signage, promotional items, marketing materials, website, social media, email, blog and other official team platforms during and leading up to the 2019 season. During the season, Good Samaritan Hospital will present a 20th Anniversary Celebration at Bethpage Ballpark. The Ducks will wear special commemorative jerseys on this date, which will feature the 20th Anniversary Season and Good Samaritan Hospital logos. The date and specific festivities for the event are still to be determined. 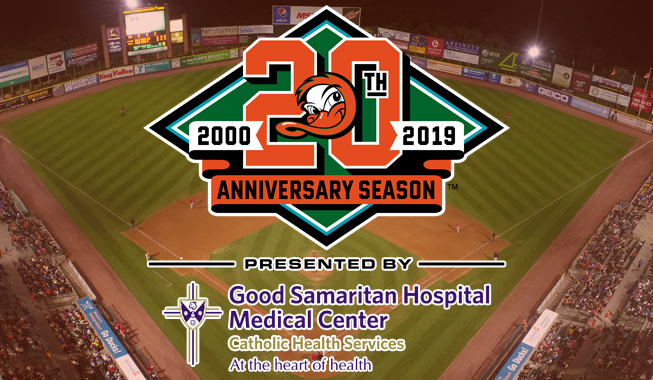 The 2019 Long Island Ducks 20th Anniversary Season, presented by Good Samaritan Hospital Medical Center, begins on the road on April 26th, with the team’s home opener to follow on Friday, May 3rd. Tickets for all Ducks home games during the 2019 season, including the 20th Anniversary Celebration, are now on sale. Fans wishing to become season ticket or mini plan holders should call (631) 940-3825 and speak with a ticket sales representative. Group ticket packages are also now available, while individual game tickets will go on sale in March. Good Samaritan Hospital Medical Center is a member of Catholic Health Services of Long Island. Located in West Islip, Good Samaritan is a 537-bed (including 100 nursing home beds), voluntary, not-for-profit hospital. The Medical Center has more than 3,438 employees and 900 physicians on staff and had nearly 26,000 patient admissions and nearly 90,000 emergency department visits in 2017. For more information, please visit the website at www.good-samaritan-hospital.org.